There is a lot of hoopla about Irish retail sales stats released today by CSO. Irish and foreign media and even some analysts are quick to point to the headline numbers showing high rates of growth and some are going as far as describing Ireland's miraculous recovery. So what, really, is going on? In Value Index terms, things have improved, which is a positive - so far in the crisis, value of sales trended well flatter than volume of sales primarily due to deflation in the sector. This was good for consumers, but bad for businesses as profit margins shrunk and with them, employment declined too. 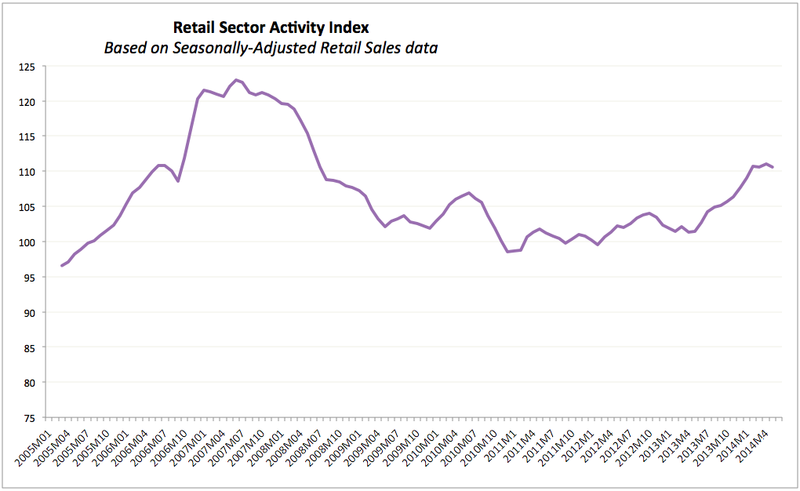 In May 2014, value of retail sales index rose to 94.6, up 1.39% y/y. Good news for retailers. Even better news: 3mo MA through April 2014 is up 1.7% y/y and 6mo MA is up 1.4% y/y. All in, we are seeing some fragile gains here. Also in Value index terms, this time around based on seasonally-adjusted data: month on month things are not so good: index is down 0.31% on April. So short-term, things are not better this time around. Not to panic, of course, as they are volatile and as trend remains up, albeit gently and unconvincingly so far (see first chart). We are bang-on on the trend now. In Volume index terms, the index is under performing recent trend, but is still pointing up on average. Although m/m index is down 0.48%, year-on-year volume of sales is up 3.33%. 3mo MA through May 2014 compared to 3mo MA through February 2014 is up 3.7%, stronger than Value index, implying potentially lower margins. Year on year 3mo MA is up 3.33% a notch slower than 3.36% 6mo MA on previous 6mo MA. 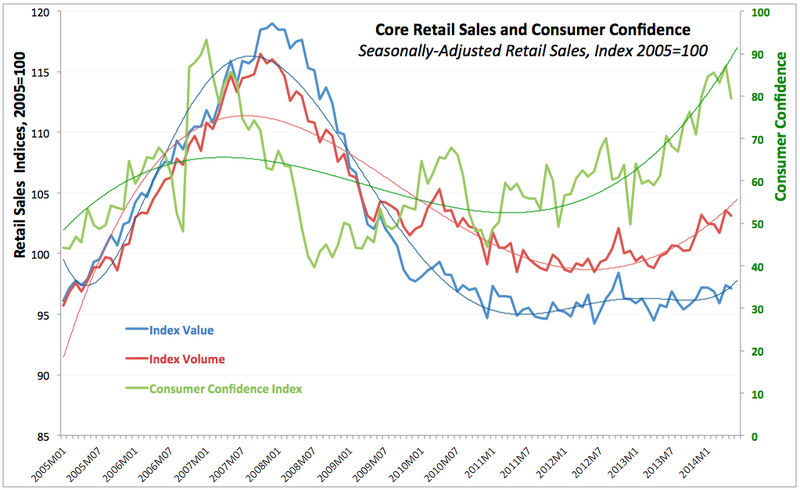 My Retail Sector Activity Index (RSAI) capturing simultaneously Value and Volume Indices, plus Consumer Confidence, reported by the ESRI has moderated from 111.0 in April 2014 to 110.6 in May 2014. Year on year, the RSAI is up strongly, from 101.4 back in May 2013, but on shorter-run horizon, the index is just about at the levels set in February-March 2014. 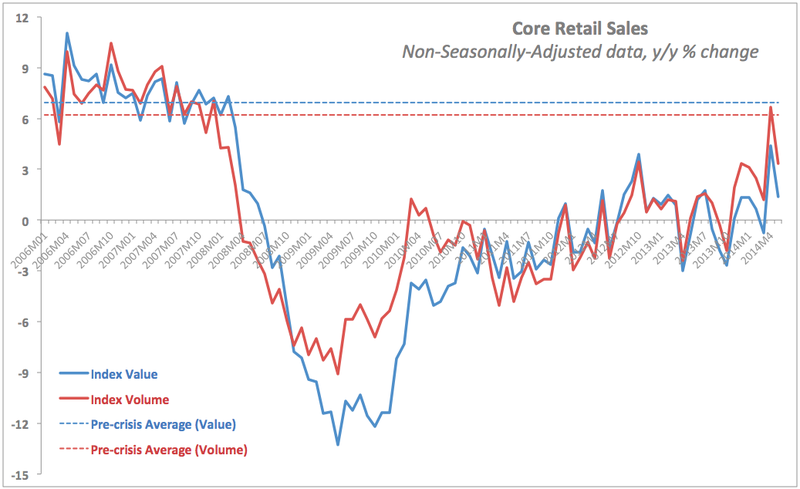 Top conclusions: All of the above are good readings, suggesting that while deflationary pressures remain a challenge, core retail sales have been improving. In previous months' posts, I noted that in my view, we are now on an upward trend in terms of Volume and at the start of a more cautious upward trend in Value terms. May data confirms this, as does the chart below showing current y/y growth compared to pre-crisis historical averages. April 2014 reading for Volume touched just above the pre-crisis average growth rate (not the levels), this moderated back in May. Value index growth rates remain disappointingly below those recorded before the Great Recession. In terms of levels, Value index (3mo average through May 2014) is currently 41% lower than historical peak levels and 13.8% below pre-crisis average. Volume index is 37.5% below its historical peak and 8.6% down on pre-crisis average.